In recent years the systems used for automated control of center Pivots have dramatically increased in sophistication. One way to improve center Pivot operation is upgrading from a mechanical control panel to a programmable panel. Growers can also incorporate mobile management tecnology that allows control panels to be accessed and changed from anywhere in the world via cellular phone. And at the very high end, growers can use online control systems, where several center Pivots can be linked up and controlled from the office via computer. A sprinkler package is designed for a specific operating pressure, which is usually specified at the Pivot point (at the top of the Pivot elbow). After the installation is complete and the center Pivot is being operated, it should be verified that the pressure available is adequate. This is important because pressure-regulated center Pivots that operate below recommended pressures will not irrigate uniformly. 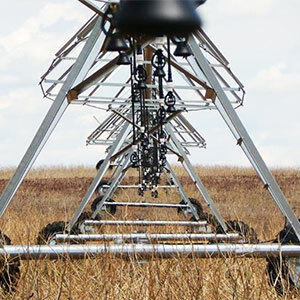 To check center Pivot operating pressure, the machine should be moved to the highest elevation point and an accurate pressure gauge should be placed on the end of the system. It is important to monitor the pressure each year and throughout each season. If the pressure begins to decrease, this can be a sign of problems with the pumping equipment or other problems in the water delivery system. If wheel track problems are anticipated or become an issue, some solutions are: using different tire sizes, using products that wrap around tires and spread out the weight of the Pivot, or initially designing the machine with shorter span lengths to reduce the weight on the tires. Regardless of the tire choice or span configuration, the best method to control wheel tracks on heavier soils is to keep the water away from the wheel tracks. Boombacks can be used to place the water behind the wheels and, when used in conjunction with 180-degree sprinklers, the wheel track can be kept fairly dry in some cases. Additionally, water applied near the wheel tracks can be reduced or a remote drain can be installed that will drain the spans through the sprinkler and away from the drive unit.